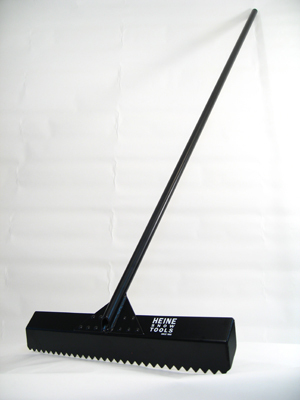 The Grooming Rake is designed to groom pipe walls and jump take-offs and landings. 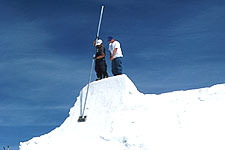 The grooming rake is specifically designed to smooth out loose snow chunks left behind after building a jump. An added benefit is its usefulness in eliminating stubborn ruts in pipe walls by flipping the blade over and shaving away excess snow. The grooming rake is also great in chairlift loading and unloading areas. Its diamond shaped teeth smooth out ruts leaving a corduroy finish. Over 1,000 of these rakes have been sold. 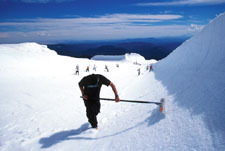 Heine Snow Tools grooming rakes are used by Mt. Hood Meadows, Snow Summit, Mammoth Mountain, and the X Games as well as many others! 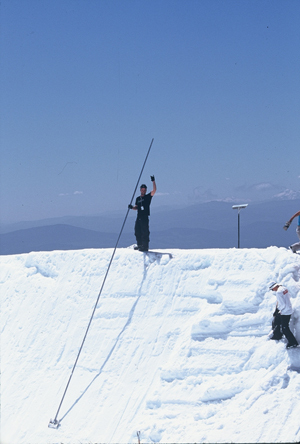 The Transition Shovel is designed to shape quarter and half pipe walls. It also works great for shaping park jump take-offs and landings. Our unique blade angle gives the correct shape to quarter and half pipe wall transitions. An extra long handle is specifically designed to shape the top 2/3 of the walls from the deck. The transition shovel blade is constructed of stainless steel and the handle is made from quality aluminum. It comes in a stock length of 8.5ft. Extension handles are also available in a 8.5ft length (making the shovel 17ft long) and can be custom ordered in any length for those extra large quarter pipes and jumps. The transition shovel gets in and fine tunes what a snowcat cannot. It is a must for all snow parks!